We have all been there! Checking out kinders can be challenging. We don't know their names yet, and they don't know us! This leads to some very interesting exchanges. Some that sound a little bit like this. "What's your name kiddo?" "mmdfdm adfdsafds" "Can you say that one more time honey" "mmdfdm adfdsafds" "How about a little louder?' "mmdfdm"
And with a little bit of time and a bit more patience, I had one of these for each of my kindergarten students. 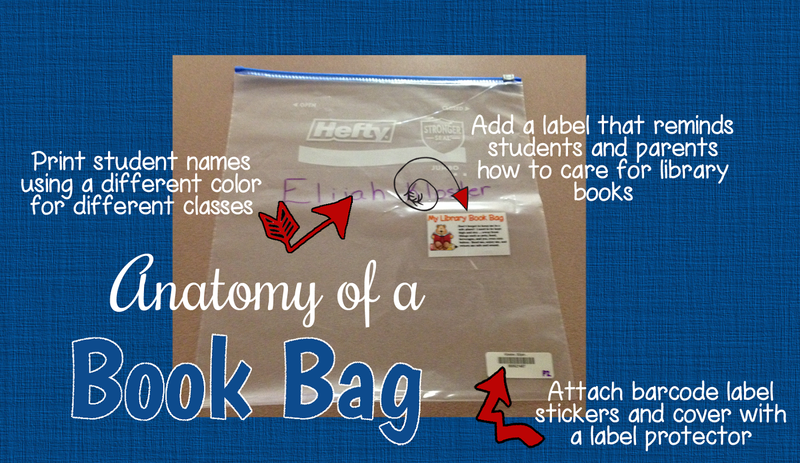 I use a 2.5 Hefty One Zip bag for each student. With a sharpie marker, I write their name on the front. 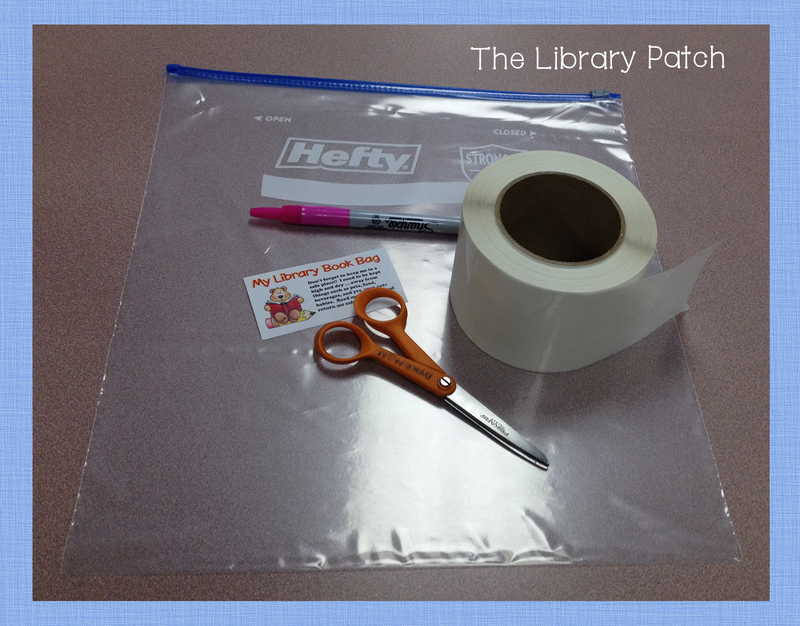 I print out colored copies of that little label "My Library Book Bag" and use two heavy duty labels to stick it to the bag. Then, I print out student barcode labels from my Destiny program and label stick them to the bag too. I teach my munchkins to search for a book, slide it into the bag, and then come on up to the desk for a beep. We actually practice the chant ... "Book! Bag! Beep" "Book! Bag"! Beep!" "Book! Bag! Beep!" Soon, my kinders know checkout procedure. These crazy bags also help me to know who HAS and who has NOT returned their library books. No bag ... no new book! Hey, I know that it's October! But, it is never too late to implement a little something new! 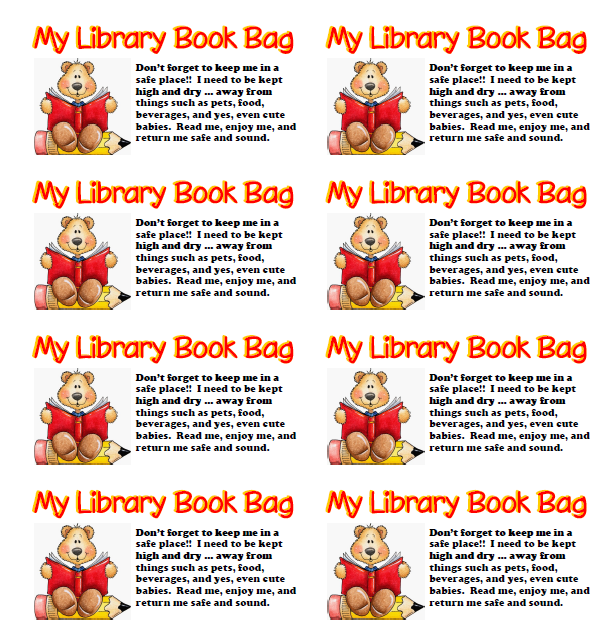 Interested ... you can download "My Library Book Bag" labels. Click on the pix below. 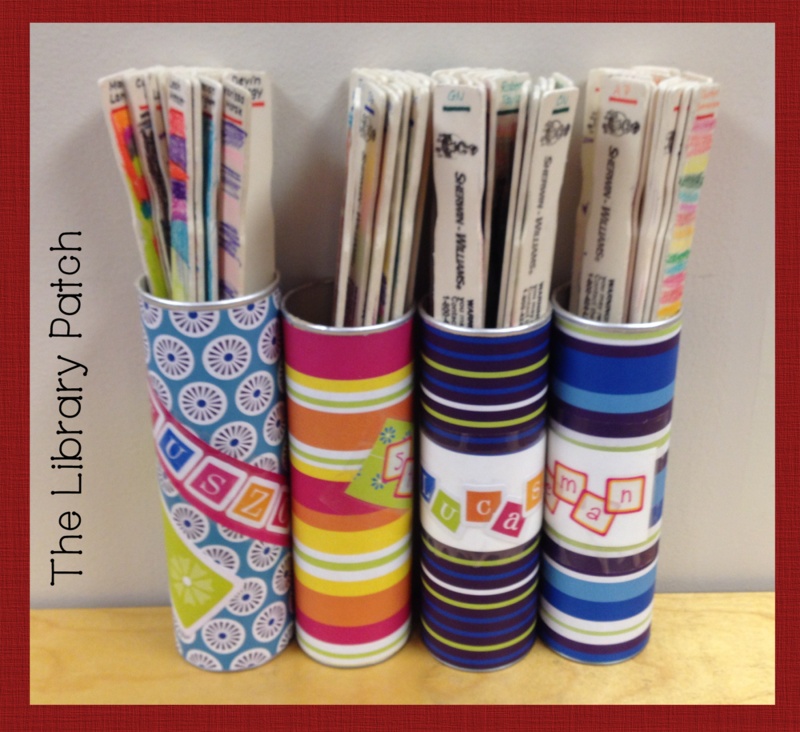 Last Spring, I was telling my library assistant that I wanted to try to use paint sticks as shelf markers, and that I wanted to personalize them with the kids' barcodes for this year. So, after first grade orientations, my little ones had a shelf marker review lesson, and we decorated our own shelf markers! I love how first graders think that everything is SOO fun. 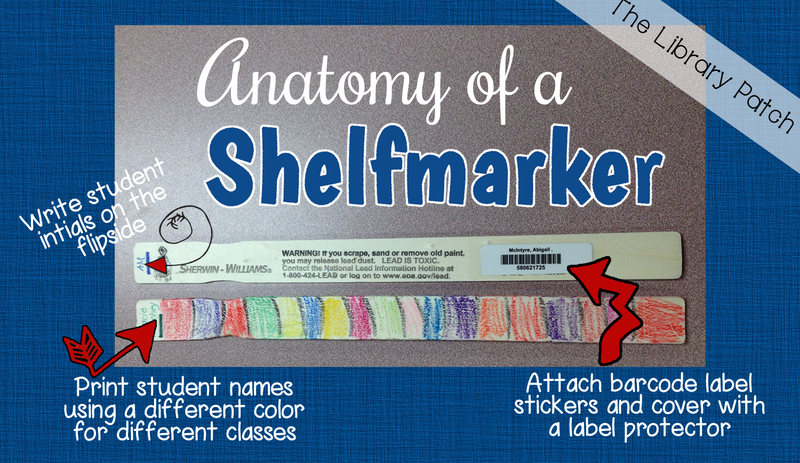 After the littles added a bit of pizzazz to their shelfmarkers, I added their names and barcodes. After about a week of usage, I realized that I had to add a few extra touches to our shelf markers to make them more kid friendly. So, I added the kids initials to the end of the marker. This has proven to be invaluable in keeping the sticks in their right cans and has helped the kids find their stick quite quickly. Then I added my own pizzazz to some Pringles cans! We store the shelfmarkers in these Pringle cans divided by classroom teachers. We love how quickly and easily that we can check our first graders out now! Beep ... Beep and they are outta there :) The kids love knowing that they have a little something of their own. It's cute to hear them chatting with each other about what they drew on their "stick".